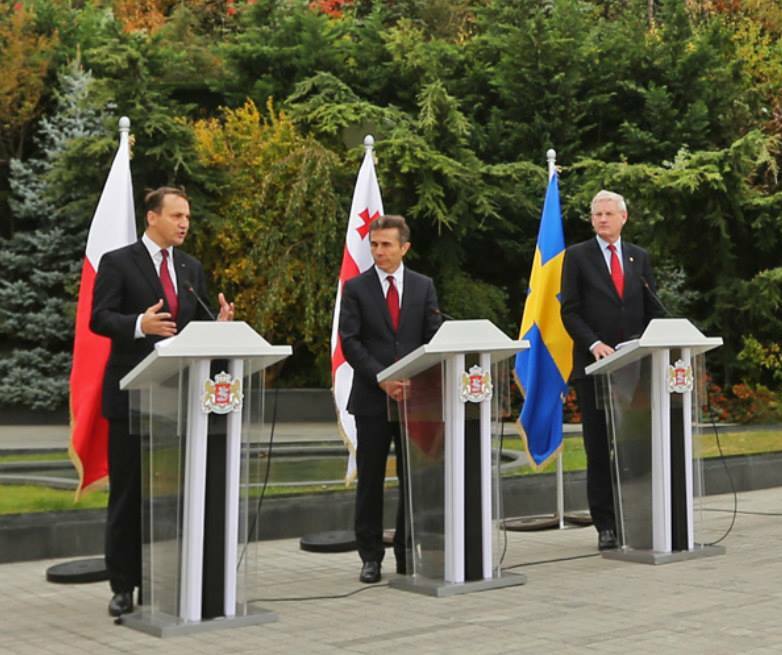 TBILISI, DFWatch–Prime Minister Bidzina Ivanishvili on Wednesday met with the foreign ministers of Sweden and Poland. The meeting was closed to the media, but a joint press conference was held afterward. The PM said the guests were interested in the ongoing political and legal issues in the country. “I explained the situation here to them and observed differences in our views. The only difference is [that] they know less [about] the current reality in Georgia,” he said, adding that the guests also asked about his views regarding Russia. Radoslaw Sikorski, Poland’s Minister of Foreign Affairs, said that he is confident that Georgia will initialize the Association Agreement with the EU at the upcoming summit and next year sign it, which means that Georgia will be ‘truly implementing European law’ like the other countries. He said that now he is standing next to a person who voluntarily agreed to leave the post of prime minister, which is ‘unprecedented’ in politics. “We are here knowing that within about a month many things will change, not just the personalities of Georgia’s president and prime minister, but also Georgia’s constitution, transforming Georgia into a cabinet parliamentary democracy,” he said. He also said that what Georgia can best do on the way of implementation of the Association Agreement, is to continue its modernization and avoid the perception of politically motivated justice. Both he and Carl Bildt, Foreign Affairs Minister of Sweden, believe that the election campaign in Georgia so far fully meets European standards. “You are now heading to the Vilnius summit of the European Partnership, where you will in parallel together with Moldova, initialize the Association Agreement with the EU and the Deep and Comprehensive Free Trade Agreement,” Bildt said.